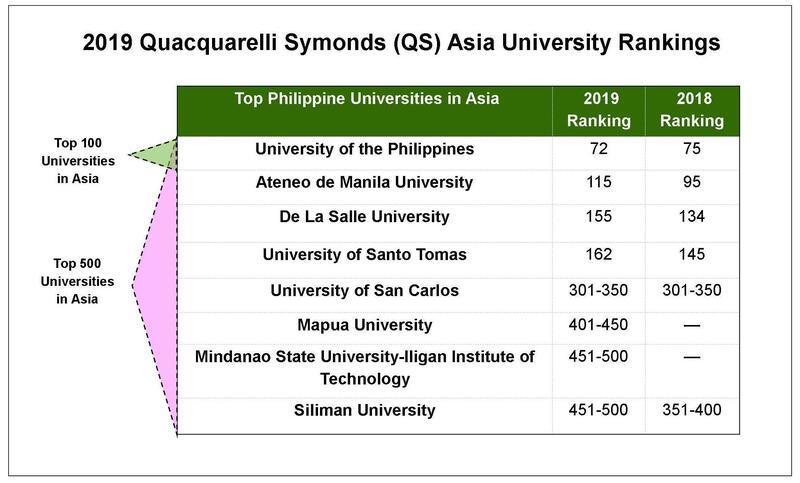 "The University of the Philippines (UP) is the only Philippine university that made it to the top 100 of the 2019 Quacquarelli Symonds (QS) Asia University Rankings released Wednesday, October 24. UP also climbed in rank from 75th in 2018 to 72nd in 2019, followed by the Ateneo de Manila University (AdMU), now ranked 115th from 95th in 2018. Rounding up the 8 Philippine universities in the 2019 list is Mapúa University (401st-450th) and the Mindanao State University-Iligan Institute of Technology (451th-500th)..."